There are 17 Memory Care Facilities in the Wesley Chapel area, with 1 in Wesley Chapel and 16 nearby. The average cost of memory care in Wesley Chapel is $5,200 per month. This is higher than the national median of $4,650. Cheaper nearby regions include Thonotosassa with an average starting cost of $2,500. To help you with your search, browse the 26 reviews below for memory care facilities in Wesley Chapel. Better rated regions include Tampa with an average rating of 4.4 out of 5 stars. Caring.com has helped thousands of families find high-quality senior care. To speak with one of our Family Advisors about memory care options and costs in Wesley Chapel, call (855) 863-8283. Wesley Chapel's warm weather and complete lack of snow could be a draw to seniors, who comprise 11 percent of the population. In addition, for those 540,000 seniors with Alzheimer's disease living across the state, the Wesley Chapel area offers over 100 different choices for memory care. Though these facilities are classified as Assisted Living Facilities (or ALFs), each must have staff who have been trained by a state-approved instructor in order to serve residents with Alzheimer's or any form of dementia. These memory care facilities are regulated by the Florida Department of Elder Affairs. Wesley Chapel is considered safer than 63 percent of all cities across the United States. In other words, a senior has a 1 in 90 chance of being a victim of a crime in Wesley Chapel in comparison to the national average rate of 1 in 35. Families seeking memory care in a safe area might contemplate Wesley Chapel because of its low crime rates. Social Security and pension income are exempt from taxation in Wesley Chapel and throughout the state of Florida. Because of these statewide tax cuts, families who choose memory care in the Wesley Chapel area can set aside more money to put towards caring for their loved one's memory care costs. If the average cost of living across the nation is given a score of 100, the overall cost of living in Wesley Chapel receives a score of 113 (two points higher than the average cost of living throughout the state of Florida). Families and seniors looking for memory care in the area may wish to consider their budget before moving to Wesley Chapel. Memory Care costs in Wesley Chapel start around $5,200 per month on average, while the nationwide average cost of memory care is $4,798 per month. It’s important to note that memory care rates in Wesley Chapel and the surrounding suburbs can vary widely based on factors such as location, the level of care needed, apartment size and the types of amenities offered at each community. To see a list of free memory care resources in Wesley Chapel, please visit our Assisted Living in Florida page. 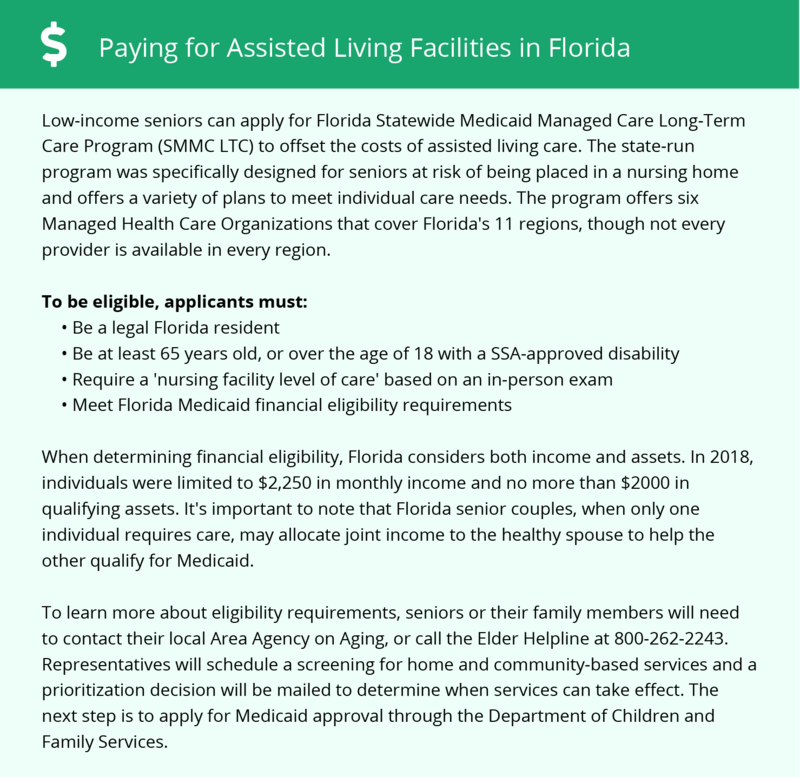 Wesley Chapel-area assisted living communities must adhere to the comprehensive set of state laws and regulations that all assisted living communities in Florida are required to follow. Visit our Memory Care in Florida page for more information about these laws.